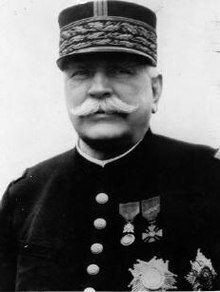 Marshal Joseph Jacques Césaire Joffre (French pronunciation: ​[ʒɔsɛf ʒɔfʁ]; 12 Januar 1852 – 3 Januar 1931), wis a French general wha served as Commander-in-Chief o French forces on the Wastren Front frae the stairt o Warld War I till the end o 1916. He is best kent for regroupin the retreatin allied armies tae defeat the Germans at the strategically decisive First Battle o the Marne in September 1914. ↑ "No. 29044". The London Gazette. 19 January 1915. p. 601.